Samoraj, M., Tuhy, Ł., Rusek, P., Rój, E., and Chojnacka, K. (2016). "Pilot plant conversion of blackcurrant seeds into new micronutrient fertilizer biocomponents via biosorption," BioRes. 11(1), 400-413. A new approach for micronutrient fertilizer biocomponent production based on blackcurrant seeds is presented. Blackcurrant seeds constitute a by-product from the production of jellies, jams, and juices. New environmental-friendly fertilizers with micronutrients were produced in the pilot plant as alternative sustainable fertilizers to conventional options. Post-extraction residues, obtained after supercritical CO2 extraction was conducted on blackcurrant seeds, were used. In each process, 15 kg of biosorbent was used. Good sorption capacity was achieved (6.48 mg/g for Zn(II), 13.9 mg/g for Cu(II) and 5.88 mg/g for Mn (II)). The adsorption kinetics was described using different kinetic models; the most suitable were the Nelson-Yoon and Thomas models. The new preparation has application-friendly form (micro-granules) and is nontoxic. For a dose of 2.5 kg of zinc, 1 kg of manganese, and 0.5 kg of copper per hectare (often used in vegetable fertilization), approximately 600 kg of mixed end product is required. The cost of fertilization with current scale technology will be about four times higher than that of conventional technology (including depreciation of equipment), but with process scale-up, it is possible to reduce costs even twice over. Biosorption describes the passive binding of metal ions (or molecules) to non-living biomass surface from an aqueous solution. This mechanism is not metabolically controlled (Davis et al. 2003). In the last few years, the biosorption process has been widely studied with different types of biosorbents and process parameters, primarily at the laboratory scale. At small scale, biosorption has been carried out in batch reactors (mostly) (Malakahmad et al. 2011; Khouni et al. 2012) or column reactors (Cheknane et al. 2012; Rubilar et al. 2012; Singh et al. 2012). Biosorption has been used as a process for metal ion removal or recovery from solution as an alternative to conventional processes based on adsorption by activated carbon (Veligo and Beolchini 1997). Also, high effectiveness in dye removal from wastewater has been reported (Mahdavi et al. 2001; Robinson et al. 2002). 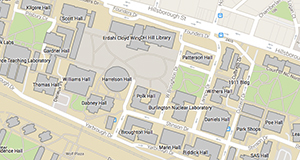 Research at the laboratory scale has led to process scale-up. Presently, the biosorption process has the potential to be used in waste water treatment on an industrial scale (Osaizua et al. 2013). In this approach, very important advantages of biosorbents such as high availability, low cost, easy recovery, and regeneration have been shown (Gupta et al. 2010). Another possibility for biosorption application is the use of this process in the production of micronutrient dietary biocomponents for animals (Witkowska et al. 2014). The most frequently used biosorbents are microalgae (Kondo et al. 2013; Yu et al. 2014), macroalgae (Koutahzadeh et al. 2013; Aytas et al. 2014), fungi (Mahmoud et al. 2013; Subbaiah and Yun 2013), agricultural wastes (Baccar et al. 2013; Jain et al. 2013; Yuvaraja et al. 2014), and plant biomass (Chojnacka 2010). Post-extraction residues after supercritical CO2 extraction of berry seeds are new promising biosorbents. Blackcurrant seeds constitute a waste from the production of jellies, jams, and juices. Blackcurrant production in Poland is approximately 200,000 tons/year (Polish Central Statistical Office (2014), and seeds constitute 15% to 30% of the weight (Hilz et al. 2005). Blackcurrant seeds are subjected to supercritical CO2 extraction for the production of oils used in pharmaceutical or cosmetic industries (Danaher et al. 2011; Costa et al. 2013; Linnamaa et al. 2013). Extracted oils have anti-oxidative properties and therefore could be used as functional foods or food supplements. Berry seeds are also rich in vitamin C, carotenoid phytosterols, phenols, and fiber (Lu and Yeap 2003). After the extraction of oils from the seeds, post-extraction residues, which are waste materials, are obtained. Their utilization is problematic. One of the methods of management of these residues is use as a fertilizer biocomponent. Blackcurrant seeds contain a large number of lignans and cutin polymers with hydroxyl and epoxy groups (Hilz et al. 2005; Linnamaa et al. 2013). They are also the source of all essential amino acids and good grade quality proteins. Moreover, they are rich in many functional groups, such as carboxyl, amine, and hydroxyl groups, present on cell walls (Chojnacka 2010), which ensure good biosorption properties. During biosorption, metabolically inactive organic matter is enriched with micronutrients in a process based primarily on adsorption and ion exchange (Chojnacka 2010). The content of toxic elements remains below the permissible limits. This approach allows the enrichment of biomass with trace elements that are important in plant nutrition. Micronutrients become reversibly bound to organic matter and might be released in a controlled way according to equilibrium dependence; thus they are better assimilated by plants and should provide decreased leaching to groundwater (Tuhy et al. 2014). Recent studies show that these preparations are non-toxic to plants, biodegradable, and cheap (Samoraj et al. 2014). Enriched biomass should be also characterized by higher bioavailability. In Poland about 40% of soils are deficient in copper and 10% deficient in manganese and zinc (Lipiński 2009). Biomass enriched with these micronutrients can help in solving this issue. The aim of the present work was to produce via the biosorption process new environmental-friendly biocomponents with micronutrients. Biosorption was conducted in an innovative pilot plant, with two columns operating in parallel (200 L each). For the experiments, post-extraction residues, after supercritical CO2 extraction conducted on blackcurrant seeds, were used. Qualitative and quantitative analysis, as well as preliminary economic analysis of the production of micronutrient fertilizer bio-components on new pilot plant installation, were conducted. This is a new, useful approach to biosorption: production of a value-added product utilizing post-extraction residues. Former applications of this process have focused on wastewater treatment. For the experiments, post-extraction residues after supercritical CO2 extraction conducted on crushed blackcurrant seeds, delivered by New Chemical Syntheses Institute (Puławy, Poland), were used. Blackcurrant seeds were recovered from industrial pomaces, disintegrated and extracted with supercritical CO2 at 50 °C under pressure 280 to 360 bar for 270 min. The biosorption of Zn(II), Cu(II), and Mn(II) by biological material was conducted in the pilot plant for biosorption processes (200 L column for each reactor) separately for each micronutrient for 6 h. The concentration of Zn(II) (ZnSO4∙7H2O, POCH, Poland), Cu(II) (CuSO4∙5H2O, POCH, Poland), and Mn(II) (MnSO4∙1H2O, POCH, Poland) in the solution was approximately 500 mg/L for each process. In each process, 15 kg of biosorbent was used. The pH was regulated by a pH regulator (PH Regulator, Mirekkon, Poland) at 5. The biosorption process was conducted at 25 °C. After each batch, the suspension was transferred to a filter press (PKF 500, MONTECH, Poland) for biomass recovery. The final product was dried in industrial dryer (ST-2, Hajnowka, Poland) at 50 °C for 24 h.
For the experiments, post-extraction residues obtained after supercritical CO2 extraction conducted on blackcurrant seeds, were delivered by New Chemical Syntheses Institute (Puławy, Poland). The experimental plant for biosorption processes (Fig. 1) was located in a municipal water treatment plant containing cation and anion exchange columns (1). Ion exchange took place in a two column system, where one was packed with a strongly acidic cation exchanger operating in a hydrogen cycle and the other was packed with an anion exchanger operating in a hydrogen-oxygen cycle. Water conductivity after the demineralization process was approximately 10 µS/cm. Demineralized water was stored in a 1-m3 tank, which acted as a buffer. The tank (2) was equipped with a pump (3) that was used for pumping demineralized water to tank (4), where micronutrient solutions were prepared. Micronutrient salts were fed through special holes in the tank with an agitator. The micronutrient solution was mixed with the agitator (5). The micronutrient solution tank had inlet pipes for feeding HCl or KOH with membrane pumps and a pH regulator that controlled pump operation by adjusting the pH value. The micronutrient solution of proper concentration and pH value was pumped with an impeller pump to reactor 6. Reactor covers were equipped with special spray nozzles (8), which enabled uniform feeding of the micronutrient solution on the biomass bed, and a perforated bottom (9) or sorption basket (10). The system contained a biomass grinder (12), from which homogenized biomass was fed to a proper reactor. Eluent from reactor 6 was pumped with an impeller pump (11) to a liquid fertilizer tank (16). Biomass suspension, after the biosorption process, was pumped with a peristaltic pump (13) to a cell chamber filter press. Dehydrated biomass was directed to a dryer (15), and eluent went to the liquid fertilizer tank (16). Pilot plant installation and the process for the production of new fertilizers has been reported for patent protection (Chojnacka et al. 2013; 2014). To perform multielemental ICP-OES analysis, each material (1 g) was digested with nitric acid – 69% m/m (5 mL), spectrally pure (Suprapur®, Merck, Germany) in Teflon® bombs in a microwave system (Start D, Milestone, USA). Parameters of the mineralization process were matched to assure complete digestion of samples. Samples were diluted 10 times with ultrapure water (Simplicity®, Merck Millipore, Germany). The concentration of elements in digested biomass after mineralization was determined by optical emission spectroscopy with inductively coupled plasma (ICP-OES, Varian-Vista MPX, Australia), equipped with an ultrasonic nebulizer (U5000AT+, Cetac, USA). The analyses were carried out using self-established procedures in a laboratory accredited by the Polish Centre of Accreditation (PCA) according to PN-EN ISO/IEC 17025:2005 (International Organization for Standardization, 2010). Quality assurance of the test results was achieved using a combined quality control standard from Ultra Scientific (USA). All samples were analyzed in three repeats (results of analyses are the arithmetic mean; the relative standard deviation was < 5%). The biosorption capacity and the amount of materials produced in the biosorption process in the pilot plant are presented in Table 1. The changes in Ca(II), K(I), Mg(II), and Na(I) concentrations during the process are presented in Fig. 2. As shown, ions were released during biosorption. Ca(II), K(I), Mg(II), Na(I) ions were exchanged during process with micronutrients ions. ICP-OES is very sensitive method with low limits of detection. Quantitative results may depend on material batch but always the same ions take part in ion exchange during biosorption. 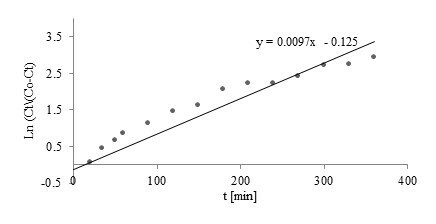 Thomas, Yoon Nelson, Adams-Bohart, and Walborska model parameters using linear regression analysis for Zn(II), Cu(II), and Mn(II) biosorption by post-extraction blackcurrant seeds residues (PBSR) are presented in Table 2.
qe (mg/g) – predicted adsorption capacity. The linear form of the Thomas model is given as Eq. 2 (Table 2). kYN (1/min) – rate constant. The linear form of the Yoon-Nelson equation is expressed as Eq. 4 (Table 2). The linear dependence of the Yoon-Nelson model corresponds to the same mechanism as the Thomas model. 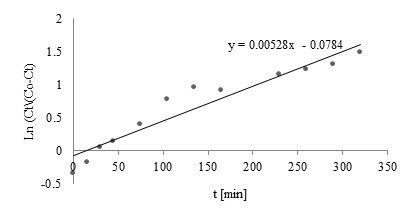 v – migration rate of the solute through the fixed bed (m/min). From the linear Eq. 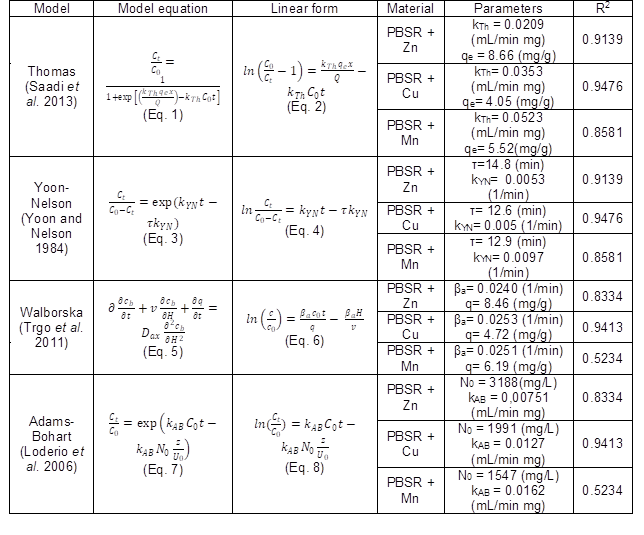 6 (Table 1), showing the relationship between ln (c/co) and t, the model parameters βa and q can be determined. z (cm) – bed depth. The linear form of the model is shown in Eq. 8 (Table 2). The linear dependence of the Adams-Bohart model is similar and corresponds to the same mechanism as the Walborska model; therefore, the same plots are used in the calculation of parameters for both models. 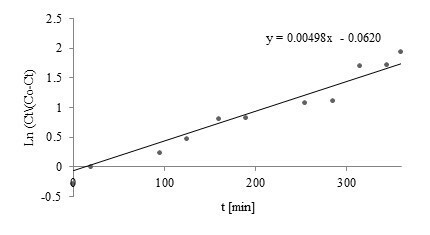 Comparison of the Thomas, Yoon-Nelson, Adams-Bohart, and Walborska model parameters using linear regression analysis for Zn(II), Cu(II), and Mn(II) biosorption by post-extraction residues of blackcurrant seeds is shown in Table 2. Linear plots of the Nelson-Yoon model with experimental data for Zn(II), Cu(II), and Mn(II) are shown in Figs. 3 through 5, respectively. Among the examined kinetics models, the Yoon-Nelson and Thomas models showed a good fit to the experimental data (among examined models – Figs. 3 through 5). Coefficients of determination obtained for both models were high (R2=0.9139, 0.8581, and 0.9476 for Zn(II), Mn(II), and Cu(II), respectively). Adams-Bohart and Walborska models described the conducted process with worse correlations (R2=0.833, 0.523, and 0.941 for Zn(II), Mn(II), and Cu(II), respectively). Comparable values of sorption capacity calculated with the Thomas kinetics model (8.66 mg/kg for Zn(II), 4.05 mg/kg for Cu(II), and 5.52 mg/kg for Mn (II)) and determined by ICP-OES (6.48 mg/kg for Zn(II), 13.9 mg/kg for Cu(II), and 5.88 mg/kg for Mn (II)) were achieved. The linear dependence of the Yoon Nelson model corresponds to the same mechanism as the Thomas model. Using Yoon-Nelson and Thomas model it is possible to determine crucial process parameters for the description of the conducted biosorption. The application of the Yoon-Nelson model is connected with the definition of a low number of process parameters; hence, it is more universal and probably could be fitted to the description of the kinetics of a broader spectrum of biomasses enriched with cations in the developed installation. The biosorption process in which the residues after supercritical CO2 extraction of blackcurrant seeds (PBSR) were enriched with zinc, manganese, and copper ions was conducted. Experiments carried out in pilot plant installation allowed a preliminary economic analysis of the biosorption process. The micronutrient content of enriched biomass and the amount of produced preparations are presented in Table 1. The disposal costs of PBSR are usually reduced to the transport cost and can be estimated as $60/Mg. The biomass loss during the biosorption process did not exceed 13%. The approximate cost of the production of 1 ton of PBSR enriched with micronutrients, including media and reagents, is presented in Table 3. 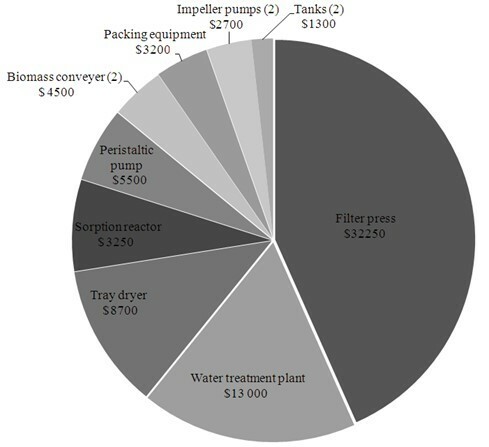 The estimated cost of the production of micronutrient fertilizer components based on PBSR in the pilot-plant is approximately $913. This could be significantly reduced by changing the drying system, which was shown to be the most costly part of the process and constitutes 44% of the total costs. The cost of installation was estimated as $74,400, and the costs of particular devices are presented in Fig. 6. It was assumed that the period of total depreciation of the installation is five years, so the calculated annual depreciation is 20%. Accordingly, daily depreciation for the pilot plant was evaluated at $40.80. It was found that the enrichment of one batch of PBSR with micronutrients via the biosorption process in the pilot-plant took 8 h (6 h of the process and 2 h of biomass pretreatment, conservation of installation, etc. ), which allows three cycles per day. The process is automated; therefore, only one person is needed to conduct the process. To sum up, the production requires 720 man-hours per month, which gives four people employment as full-time workers and one as a half-time employee. Accordingly, monthly labor costs were estimated as $3,600 ($120 per day). In one production cycle, there is a possibility to produce 17.4 kg of enriched biomass and hence 52.2 kg each day. The total cost of the production of one kg of new preparation, including production cost, labor costs, and depreciation of the installation, is $3.60 ($4.00 after the drying process, listed as the most expensive). Taking into account managing costs and the producer margin (about 150%), the final price is $6.00, which could be reduced to $5.40 by the application of alternative drying. Because the dosage of new preparation as micronutrient fertilizer component is approximately 0.1% to 0.5% when mixed with NPK fertilizer, the price seems to be attractive. The conversion of PBSR into micronutrient fertilizer component by biosorption in the developed pilot plant was shown to be an efficient and economically feasible process. The production cost of one batch of biocomponent with micronutrients (17.4 kg) was less than $70, and drying constitutes the most expensive part of the process (44% of production costs). Conducting the process in the plant in quarter-technical scale enabled the experiment to underline its advantages and disadvantages. Quantitative analysis of the process showed that the production of micronutrient fertilizer components in the pilot plant was not affected by high material losses (15%). The calculated costs of the installation and produced preparations were shown to be relatively low. The application of a pH regulator enabled a constant pH during the process. The presented pilot-plant was equipped with a biomass grinder for standardization; therefore, it was possible to process different types of biomass. Mechanical drying of enriched biomass in a chamber filter press allowed for preliminary drying of the product and a slight reduction of drying costs, which, as mentioned, was the source of the highest costs. Alternative methods of drying of enriched biomass can significantly reduce production costs. The presented technology can be applied for the production of micronutrient fertilizer components based on waste biomass, which can be used in plant cultivation. The product of the biosorption process constitutes a source of micro- and macronutrients in forms easily assimilated by plants, which can lead to the biofortification of plants with essential elements. Furthermore, waste biomass enriched with micronutrients can be used as an alternative to traditional micronutrient fertilizers (Michalak et al. 2013). The technology described in this paper and the utilitarian properties of the produced preparations were examined in laboratory scale and in environmental conditions; therefore, the technology readiness level can be estimated as TRL5 (European Commission 2014). A pilot-plant installation for biosorption was described. Furthermore, the technology of the production of micronutrient fertilizer components with the use of blackcurrant seed post-extraction residues with kinetics description and economic analysis was proposed. New technology and product were examined in laboratory scale and in environmental conditions; therefore, the technology readiness level can be estimated as TRL5. It was shown that the installation enabled effective production of micronutrient fertilizer bio-components, and the high productivity of the process was confirmed. The presented technology was shown to be an innovative method of micronutrient fertilizer production and, as shown by economic analysis, the production process did not require high financial outlays. This work was financed by the Polish National Science Center, project No UMO-2012/05/E/ST8/03055. Publication was supported by the Wroclaw Centre of Biotechnology under The Leading National Research Centre (KNOW) programme for the years 2014 to 2018. Chojnacka, K., Rusek, P., Witkowska, Z., Tuhy, Ł., Witek-Krowiak, A., Saeid, A., and Samoraj, M. (2013). “Układ do biosorpcji mikroelementów (A system for biosorption of micronutrients),” Patent application No. P 404983. Chojnacka, K., Samoraj, M., Tuhy, Ł., Witkowska, Z., Michalak, I., and Górecki, H. (2014). “Sposób wytwarzania mikroelementowych komponentów nawozowych oraz mikroelementowe komponenty nawozowe (Method for producing micronutrient fertilizer components and micronutrient fertilizer components),” Patent application No. P.407673. European Commission (2014). Technology readiness levels (TRL), HORIZON 2020 – WORK PROGRAMME 2014-2015 General Annexes, Extract from Part 19 – Commission Decision. International Organization for Standardization (2010). “General requirements for the competence of testing and calibration laboratories,” ISO 17025:2005. Lipiński, W. (2009). “Ocena zasobności gleb Polski w mikroelementy (in polish),” Zesz. Probl. Post. Nauk Rol., 541, 291-296. Liu, J., Schulz, H., Brandl, S., Miehtke, H., Huwe, B., Glaser, B. (2012). “Short‐term effect of biochar and compost on soil fertility and water status of a Dystric Cambisol in NE Germany under field conditions,” J. Plant Nutr. Soil Sc. 175(5), 698. Michalak, I., Tuhy, Ł., Saeid, A., and Chojnacka, K. (2013). “Bioavailability of Zn(II) to plants from new fertilizer components produced by biosorption,” Int. J. Agron. Plant Prod. 4, 3522-3536. Osaizua, O., Olat, K., Pot, B., Olateju, K. S., Yetunde, A. O., and Olanike, A. Y. (2013). “Tolerance, bioaccumulation and biosorption potential of fungi isolated from metal-finishing industry waste site,” J. Appl. Sci. Environ. Sanit. 9(1), 35-44. Polish Central Statistical Office (2014) Statistical Agricultural Report of year 2014. Trgo, M., Medvidovic, N.V., and Peric, J. (2011). “Application of mathematical empirical models to dynamic removal of lead on natural zeolite clinoptilolite in a fixed bed column,” Ind. J. Chem. Tech. 18(2), 123-131. Yoon, Y. H., and Nelson, J. H. (1984). “Application of gas adsorption kinetics. A theoretical model for respirator cartridge service life,” Am. Ind. Hyg. Assoc. J. 45(8), 509-516. Article submitted: July 31, 2015; Peer review completed: October 18, 2015; Revised version received: October 30, 2015; Accepted: October 31, 2015; Published: November 17, 2015.